Furiends today’s Film on Friday shows me getting a little fluffed under the fur when one of my humans was outside this week working on the traveler project… WITHOUT me! Obviously, this isn’t acceptable because I like to supervise everything that happens on my boat. As you’ll see my yelling worked and my dad finally opened the hatch at my request. Once we’d straightened out that I’m the project manager evefurrything was fine again! What gets you fluffed under the fur? « We made an office! Even though you were angry… you were still polite! That’s important! LOL, well, you know how it is — you can’t always get what you want! Glad that you finally got your way though to outside. Have fun & be safe. You sure told your Dad how you felt about being trapped!!! I will scream at my Mom if she doesn’t IMMEDIATELY respond to me when I call her…………and I can get pretty noisy! 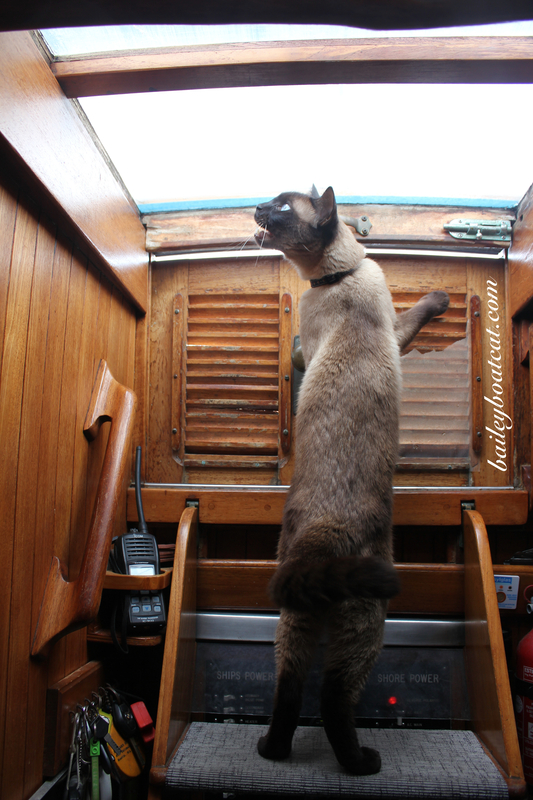 Looking forward to seeing you on Nocturne next weekend Bailey when Cat Scouts comes for a sail !! My kitties are outraged your humans had the nerve to try and start/work on a project without you present for supervision! It’s a good thing you have trained them well not to mess with you when you do get fluffed under the fur! My fur kids get fluffed when I am eating meat and I do not give it immediately over to them. They want me to surrender any and all amounts I have on the plate and will reprimand and/or attempt to swipe it right off the plate! Bailey, you certainly got MY attention! Proper thing too as you are project manager! All my sleeping dog buddies( there are 10 of us) woke up when we heard your cry for help. Most of them ran outside barking the alert. I knew it was you.My human said your meow melted her heart. Mine Too. We love you Bailey M.J. But, your mum had all the treats!!! You have a good dad who heard your pleas.